A close ally of Brazil's acting President Michel Temer is stepping aside in a new political scandal. Planning Minister Romero Juca was caught on tape allegedly conspiring to obstruct the country's biggest-ever corruption investigation. In the tapes, leaked by a newspaper, he appears to talk of stopping the probe at oil giant Petrobras by impeaching suspended President Dilma Rousseff. Mr Juca says his comments have been taken out of context. Dilma Rousseff said the tapes prove that the impeachment process is a "political coup" designed to protect senior figures implicated in the Petrobras scandal. She is accused of massaging budget figures ahead of her re-election in 2014, and is due to be tried in the senate in the coming months. In the audio transcript, leaked by the Folha de Sao Paulo newspaper on Monday, Mr Juca appears to be saying the impeachment was necessary to "staunch the bleeding" and create a "political pact" needed to "stop everything and limit things." Folha says the recording was made by the man Mr Juca was talking to, Sergio Machado. Mr Machado is a former senator who until recently headed Transpetro, Brazil's largest oil and gas transport company. He is under investigation over his alleged involvement in the Petrobras scandal. The newspaper alleges he recorded the conversations with a view to negotiating a plea bargain, wanting to exchange information implicating other suspects for a lower sentence. Mr Machado himself has not commented. For many analysts, the context of the conversation appears to be Brazil's political crisis, and he seems to be talking about preventing further investigations into Petrobras. Image caption There have been frequent protests against president Michel Temer's government in both Rio and Sao Paulo in the past week. In comments immediately taken up by Ms Rousseff's supporters as evidence for her claim of a coup, Mr Juca also said:"I am talking to the generals, the military commanders. They are fine with this, they say they will guarantee it." In a news conference, Mr Juca did not deny the authenticity of the recording but said his quotes had been misinterpreted and taken out of context. He said it was public knowledge he was in favour of the impeachment and that he had been referring to the Brazilian economy, not the Petrobras investigation, which he backed. Dozens of top-ranking politicians and business executives have been charged or already convicted for participation in the Petrobras bribery and embezzlement scheme. Mr Juca himself said :"There is nothing wrong in being investigated - there is something wrong in being charged." "I have never done anything to complicate the investigation." 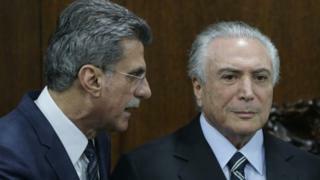 The BBC's Julia Carneiro in Brasilia says the recording reinforces scepticism in the country about President Temer's assurances that he would not interfere with the investigations. Mr Juca is one of the main architects of the impeachment proceedings against Ms Rousseff. He is also the vice-president of Mr Temer's PMDB party. Three other PMDB ministers in the new government, which took over earlier this month, are also under investigation in the Petrobras case. Dilma Rousseff impeachment: How did it go wrong for her?